JOHN WOODLEY. John was baptised in the mid-Devon village of Tedburn St Mary in 1586, in the reign of Elizabeth I. This was a year before the execution of Mary Queen of Scots. John was the eldest child (as far as we know) of John Woodley senior of Tedburn St Mary. He came from a large extended family of Woodleys in Tedburn . They had been in the parish from at least the middle ages. We believe John to have come from a branch of some standing in the village. The Woodleys whose occupations we know were farmers, either yeomen or husbandmen. It is likely that John came from a similar background. He had a younger brother Thomas, born two years later. We know of no other siblings, though damage to the register may conceal one or more baptisms. We do not know his mother’s name for certain, but she may be Thomasyne Woodley who was buried in 1590. John was four years old then. This would explain why there were no more siblings. We know from the Dunsford burial register that his wife was Bridget. We do not know her maiden name or where the marriage took place. From the date of their first child’s baptism the marriage would have taken place in or before 1608. These were the early years of James I’s reign. Jois is a contraction of Johannis, the Latin form of John. John and his young family moved to the adjacent parish of Dunsford. This lies south of Tedburn St Mary, with the River Teign as its southern boundary. There were no Woodleys here in the Lay Subsidy Rolls of 1525 and 1544, the 1569 Muster Roll or the 1581 tax assessment for Dunsford. The first mention of the Woodleys in this parish is the marriage in 1597 of Dorrity Woddley. We know no more about her. The next occurrence in the Dunsford records is the baptism of John and Bridget’s second child. The long gap means there may be one or more missing baptisms. As often happens with early records, we learn the name of John’s wife only at her burial. On 20 Jan 1621/2 John Woodley had a son Matthew baptised. This is followed a month later by a burial. 1621/2 Feb 20 Bridget wife of John Woodley. We hear nothing more about baby Matthew. The likelihood is that he died too. It seems that John remarried. There was only one John Woodley in the 1641 Protestation Return for Dunsford, so this is probably the same man. It is possible that John had gone back to Tedburn to help his ageing father, who died three years later. The couple raised their children in Dunsford. They had five children, baptised at St Mary’s. After this, the baptism register names the mother. It appears that John’s father moved to Dunsford too, confirming the impression that he was in failing health. John Woodley senior was buried there in 1634. In 1641 male parishioners over 18 were required to sign the Protestation Oath, pledging loyalty to the crown. The Dunsford roll includes Austin Woodley (a contraction of Augustine), Thomas Woodlye and John Woodlye. Thomas may be John’s younger brother. It does not include John’s second son Mark. The following year the Civil War broke out. Most of our Devon ancestors are from communities that were strongly Parliamentarian, but Tedburn St Mary and Dunsford were fervently Royalist, led by the lord of the manor, Sir Francis Fulford of Great Fulford. At the start of the war Exeter was secured for Parliament, but from November 1642 there were signs of Royalist uprising in the surrounding countryside. Mark Stoyle tells us that before this Tedburn’s village militia had taken part in military exercises in Exeter, thus supporting Parliament. Their sympathies, however, lay elsewhere. That December two men from Tedburn were paid their expenses for travelling to a Royalist muster in Modbury in South Devon. That same month the surrounding parishes assembled a store of arms in Dunsford. They were doubtless intending to join the Royalist forces of General Hopton , who was marching east from Cornwall. The constable’s accounts for Tedburn include 2s.6d paid to ‘Mistress Turner… for one hors carry the armes to Dunsford’. This is almost certainly the wife of Anthony Turner, rector of Tedburn St Mary. On 11 Dec the Parliamentary garrison in Exeter sent a troop of horse to Dunsford led by Captain Nicholas Vaughan. The intention was to capture these arms. But Vaughan was killed by a musket shot fired from a window by Humphey Southcombe, who may be related to our own Southcombes. The troops fled, leaving their officer’s body in the street. Southcombe took his gloves and spurs. A witness later testified that, on the following day, Anthony Turner, Vicar of Tedburn, and Mark Woodley, husbandman, had returned from Dunsford with ‘one of the troop horses of Exeter’, in other words, the dead captain’s mount. John Woodley’s son Mark does not appear in the Dunsford Protestation Return, but there is a Mark Wodley in Tedburn. It is tempting to see this as John’s son. But there are documents from around 1630 concerning properties in Tedburn that involve Mark Woodleigh, yeoman of Oldridge, and his son Mark. The Mark Woodley of Stoyle’s account is more likely to be this younger Mark, who lived at Tedburn Barton (Town Barton near the church). Another document from 1622 concerning Tedburn properties again involves Mark Woodleigh, but also Augustine Horwell. This is the unusual baptismal name that John gave to his eldest son. It suggests a family connection. The Mark Woodley accused of stealing Captain Vaughan’s horse may not be John’s son but is likely to be a near relative. It is highly probable that the Woodleys of Dunsford shared the same sympathies. The Rev Turner was later committed for trial in Exeter as an accessory to Vaughan’s murder. He was found in possession of Vaughan’s gloves and a spur. In his defence he said that he had gone to Dunsford ‘to speake with Mr Garnett, the parson of that parishe’. Finding Garnett away from home, he had gone to the alehouse instead. Here he met ‘James Cornishe, & Humphrey Southcombe & others, with whome … [he] did drinke some beare.’ Southcombe told him that he had ‘a commoditie for hym’. Cornish said ‘it was a good paire of gloves’. Turner said he paid little attention, but admitted paying Southcombe a shilling. He later confessed that Cornish had told him ‘that the foresaid Southcome had killed the said Nicholas Vaughan’. The Rev Garnett of Dunsford whom he mentions was a prominent Royalist supporter. Coupled with the role of Rev Turner’s wife’s in sending Tedburn’s arms to Dunsford, it would seem that the rector was also heavily involved. 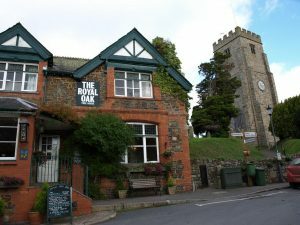 Today, the only pub in Dunsford is the Royal Oak, named after the oak tree where Charles I hid from his pursuers. This is a comparatively modern building, probably not built as an inn, but it now serves as the successor to the alehouse where Captain Vaughan’s belongings were sold. Sir Francis Fulford was the lord of the manor of Dunsford and a Royalist colonel. His home, Great Fulford, is a fortified manor house near the border of Dunsford parish and Tedburn St Mary. It has been in the hands of the Fulford family since Norman times. In January 1643 the Roundheads besieged it with canon from higher ground and took Sir Francis prisoner. He was briefly imprisoned in Exeter. While he was in jail, Great Fulford was looted by a mob from Moretonhampstead, Crediton, Sandford, Newton St Cyres and Exeter, all Parliament-supporting communities. It is even possible that some of our ancestors from these places took part. The inhabitants of Dunsford and Tedburn St Mary played no part in this raid. One feature influencing Dunsford’s opposition to the Parliamentary cause, besides allegiance to the crown, was the religious conservatism of this area. Fairfax and Cromwell’s campaign was a challenge to the king’s power, but also a bid to impose Puritan reform. John’s eldest son Augustine disappears from the records after 1641. There is strong possibility that he was one of the many casualties of the war. If so, then he was almost certainly fighting for King Charles. He left one son. In the 1660 tax return for Dunsford there are a number of Woodleys. They include John Woodley and his wife and John Woodley junior. All three are listed as poll tax payers. John died in 1661, one year into the reign of Charles II following the Restoration of the Monarchy. His will was proved that year. He would have been in his mid-seventies. The will of Joan Woodley of Dunsford was proved in 1665. There is also this burial. One of these could be John’s widow, the other may be the widow of his son Augustine. This account of the killing in Dunsford is taken from Mark Stoyle, Loyalty and Locality; Popular Allegiance in Devon during the English Civil War (University of Exeter, 1994).